What are tics in children and adults? Tics in adults and children in the scientific literature are defined as involuntary, sudden incurred forced movements of varying intensity. Most often occur in young children, usually between their fifth and tenth year of life, so it is recommended for parents to pay special attention to children if some major life changes occur in life, such as moving from home to home, divorce of parents or the arrival of a baby, or when they start at kindergarten or school. Precisely such events, which can further undermine confidence of the child, are common triggers for unwanted behaviours. Tics in children caused by these situations usually pass spontaneously, but can get worse if the child is constantly exposed to stress. What are tics in children and what causes them? For the cause of tics Epidemiological studies often cite numerous hereditary factors. They can be of varying intensity, and both sexes are subject to them. It is assumed that an increased activity of dopamine, a hormone that is produced in the brain causes tics and is responsible for emotions and mental reactions. Evaluations of the patients with this disorder have shown that they have potential decreased metabolic activity in regions of the brain responsible for movement. Secondary tics in children and adults that result from other diseases of the nervous system are far less common, but may occur after inflammation of the brain, head trauma, carbon monoxide poisoning or stroke. Certain drugs, such as levodopa, carbamazepine, phenytoin or phenobarbital, also cause tics. What are the frequent things that accompany tics? Even though the tics in adults were previously considered neurotic manifestations, today's most common opinion is that organic factors are most important for the appearance of involuntary movements. If they are accompanied by spasms, convulsions or epilepsy then it is suspected to organic origin (Tourette syndrome). Tics in children are most commonly associated with emotional problems and is often associated with increased aggression, disobedience, lack of adaptability, outbursts and tantrums, sleep disorder, urination and bowel movements, immaturity, instability, shyness. What types of ticks exist? Tics in children most often affect the facial muscles (face), body and parts of limbs. 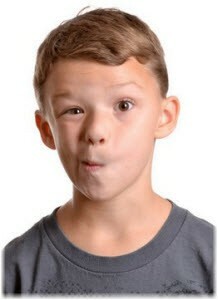 Simple motor tics are characterized by the inclusion of individual muscles or muscle groups, thus forming blinking, twitching of the shoulder, wiggling of the nose and squinting eyes in children. Complex motor tics involve movement of multiple muscle groups and can be manifested by clapping, scratching the door or nose, various grimaces, jumping, echopraxia (imitating other people's gestures) and coprolalia (obscene gestures), but are very rare. Sound motor tics are characteristically expressed by vocalizations or simple sounds such as coughing, sniffing, or even barking. They also include articulated words: echolalia (repeating what other people say), palilalia (repeating the last words of what others say) and coprolalia (uttering obscene gestures). Sensory tics include the repetition of sensations in the form of a sense of pressure, heat, cold or pain in localized areas of the body, which results movements. Patients have the need to make a move in order to stop the abnormal sensation, which is a forced phenomenon. How is this disorder diagnosed? The main criterion for the diagnosis of transient tic - a simple, multiple motor or vocal - is carrying out involuntary movements at least four weeks, but not longer than 12 months. Usually it is the case of muscle enrolment of the eye with one-sided or double-sided blinking, so-called eye tics which parents often interpret as an organic change - conjunctivitis. Transient tics in children can affect other regions, such as the torso or limbs, but they can be vocal. As a rule, they disappear in less than a year, and in 50 percent of children disappear in two to three months. The diagnosis of chronic tics, simple, multiple motor or vocal, is set if the involuntary movements are repeated in the period of at least one year, and at least three full months continuously. Occasionally motor ones just usually occur in adult and are often resistant to treatment. The lack of rhythmic repetition of these different tics from stereotyped movements is the typical case of autism or mental retardation. Obsessive-compulsive activities sometimes closely resemble the complex ones - complex tics, but with the difference that the shape does not depend on the purpose (touching an object, perform some action a number of times), but on the muscle groups involved. However, the experts sometimes have a hard time to distinguish them. Tics in children and adults often occur as an isolated phenomenon, but it happens to be associated with a variety of emotional disorders (especially obsessive ones), hypochondria or slow development. When is the treatment of tics in children required? Voluntary suppression of tics is certainly possible, but it causes a lot of uncomfortable feeling that pulls the manifestation of tics. Tics in children do not affect voluntary activity (do not interfere with writing or drinking from the glass), and for every child there are specific situations in which their frequency increases or decreases. This can be TV viewing, situations in which a person experiences pleasure or excitement, and anxiety, emotional trauma, or, for example, the presence of larger groups of people. Activities requiring full concentration usually reduce the frequency of tics. In the case of surgeons and pilots their tics completely withdraw when performed surgical procedures and flight control. The therapy is indicated only in cases where the tics in adults and children have a significant impact on their social and professional life. These involuntary movements can be associated with disorders of thinking (obsession), sensations (sensitive tics) and hyperkinetic syndrome with attention deficit. With them disorders in cognitive processes may occur such as learning, reading, writing or computing, it is dysgraphia, dyslexia, dyscalculia and the like. Also, often the tics in children are sometimes associated with sleep walking, nightmares and bedwetting. These children have an increased tendency towards depression and anxiety, inappropriate sexual and deviant behaviour. This can cause considerable problems in relationships with parents, siblings, and teachers at school and failure in education - despite normal intelligence. How to cure tics with medications? The introduction of drugs is reserved only for the most serious cases. The most commonly administered is risperidone, a drug that blocks the activity of dopamine. With varying success other drugs are applied, such as clonidine, tiapride, fluphenazine, chlorpromazine, tetrabenazine, clonazepam, flunarizine.